My husband comes from a Disney loving family, and last week his sister threw a lovely little Minnie Mouse birthday party for her daughter. I couldn't resist making her a simple little freezer paper stenciled onesie. I'd planned on using a polka dotted ribbon, but the width I had just wasn't working for me. So, I mustered all of the self control I had, and used some plain grosgrain ribbon that I had on hand. 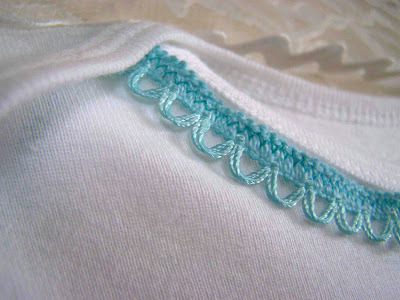 A little bit of trim around the neckline added a little something extra to the simple top. 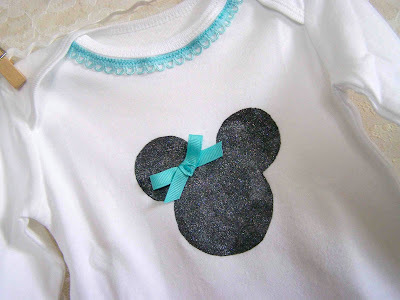 Want to make your own Minnie/Mickey mouse stencil? Here's a Minnie/Mickey Mouse Template that you can transfer to some freezer paper for a quick little project. I've added four different sizes of the template...just in case you want to throw a little Minnie Head on the bottom of your baby's onesie bottom. You can find more information on freezer paper stenciling here. So adorable, Tricia! The bow and the trim are just the right touch. That turned out adorable. I will definitely be back for the template sometime! I think you are reading my mind. :) I might have to try freezer paper stenciling. Oh my goodness! We love this little onsie! I think it is the most adorable thing ever! p.s. its a little big but she will grow into it. She is mostly a shrimp!